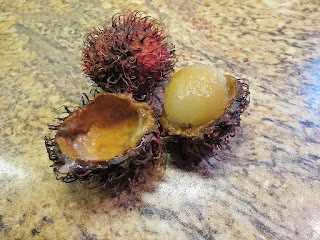 Right now, one of our local grocery stores has a sale on rambutan, this adorable and spiny fruit. They are native to Indonesia and are are totally irresistible. It's about the size of a golf ball, and if you pinch it at its seam, it will pop right open. The fruit inside is incredibly juicy and tastes very much like a kiwi fruit. It has a giant seed in the middle, but that, too, will easily come out. We were feeling adventurous yesterday and got a couple of these. They are fantastic - if you've never tried one, check out your local produce section to see if they have any. You'll be so glad you did. Believe me, I'm going back to get more!